Here are some facts about the Parthenon. The Parthenon is a ruined temple on the Acropolis hill in Athens, Greece. It has become a symbol of the country and is one of the most well-known monuments in the world. It was built between 447 BC and 438 BC, during the height of Classical Greece. It was designed to be a temple to the goddess Athena, the patron of the city. The temple was built to align with the Hyades, a cluster of stars. In Greek mythology, the Hyades were the five daughters of the strong Greek god Atlas. 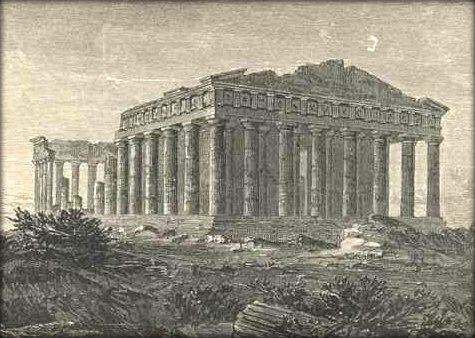 The biggest expense in building the Parthenon was transporting the 13,000 large stones 16 km from Mt. Pentelicus. The mountain is well known for its smooth and flawless marble stone quarried there. The Parthenon contained statues and carvings, many dedicated to Athena. The frieze, or carved wall inside the building shows Greek myths and legends, as well as battles. Some sculptures were removed in 1806 by the Earl of Elgin. Known as the Elgin Marbles, these are in the British Museum, despite ongoing efforts by Greece to get them back. The base of the Parthenon measures 30 by 70 metres. The 46 columns around the perimeter of the temple were designed in the Ionic style and are 10.4 metres high. Although the Parthenon was designed as a Greek temple, it was used as a Christian church in the 6th century. It has also been used as a treasury and as a mosque. In 1656, an explosion destroyed several walls and columns. In 1687 more damage occurred when Ottoman Turks defended themselves in the Parthenon against the attacking Venetians. There is a full scale replica of the Parthenon in Nashville in the United States. The National Monument of Scotland and a memorial in Bavaria, Germany are also closely modeled on the temple. What next? Learn more about the Ancient Greeks by visiting our resources page.